Wednesday is here and that means so is another Flipside U comic! 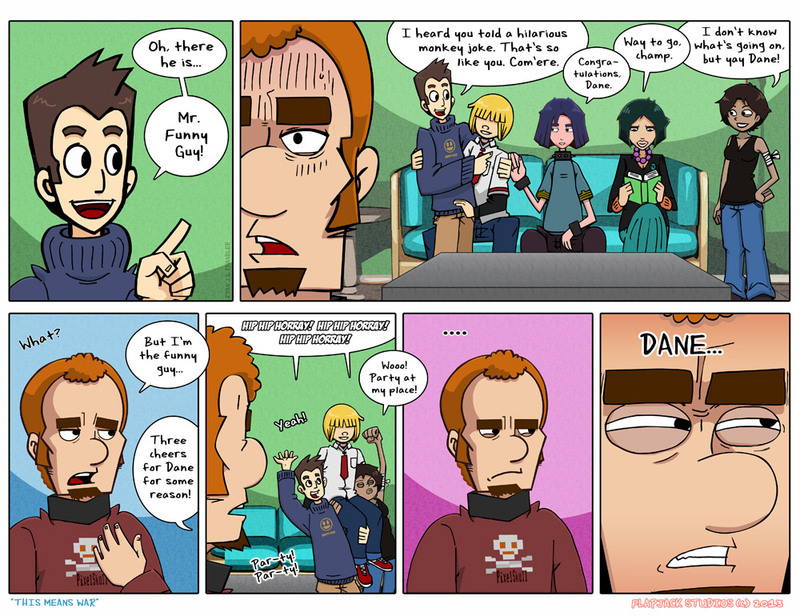 This week wraps up the "Joke Arc" with Rhed and Dane. Looks like Rhed's got his revenge sights set on Dane. But hey, I must admit, Dane is a pretty funny guy. Maybe Rhed should lighten up a bit and let bygones be bygones. Or maybe he'll declare Dane his arch nemesis and plot to destroy him. Who knows? But I digress. In other news, the Flipside U reboot is almost upon us. Expect new exciting plotlines and narratives all in an easy to read format! So stay tuned into everything Flapjack! We'll reveal the date for the re-launch soon! Keep it real y'all!